The pool juts out perpendicularly from the main house; the land was bulldozed to become level with the concrete pavers. The couple entertain friends on one of several lanais that Steely added. The chaises are from Target. The pool continues inward past the guest wing and runs beneath a small concrete bridge separating the public and private spaces. Steely credits contractor Mike Lynch with helping to engineer this feat of site-poured concrete. A hanging chair takes up a corner of the lounge–guest room. The couple gather in the central dining room, with a bamboo table by Greenington and chairs from West Elm. The pendants are by Mark Chai Arts; the tapestry is by Máximo Laura. One positive aspect of the area’s rain, beyond the lush waterfalls that lure tourists and locals alike, is the resulting flora rising from the lava. In fact, it was the native ohia tree, its gnarled gray bark offsetting its brilliant red lehua flowers, that sparked Steely’s design. “This was one of my first inspirations for building in concrete,” he says. 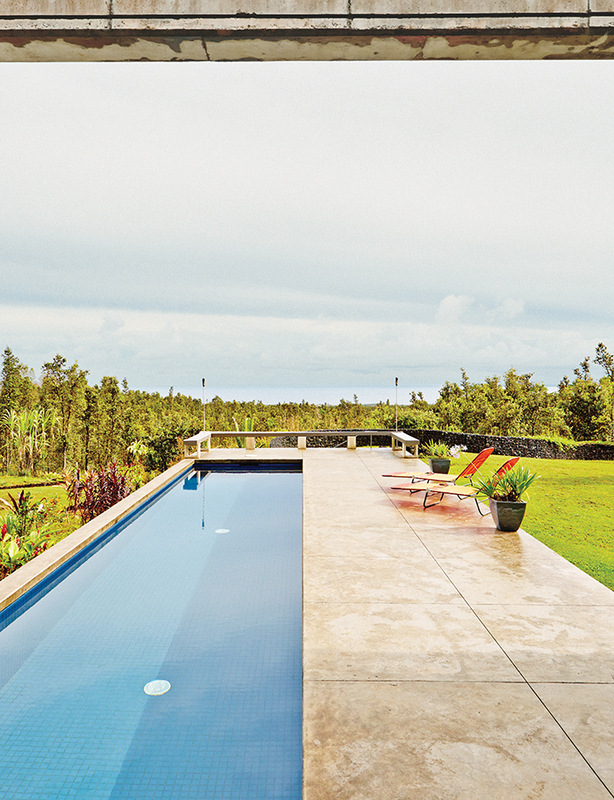 “Like the ohia, the gray concrete house would blend into the existing landscape of lava and trees, while splashes of color in the house would mimic the lehua.” The five-acre-plus site, which the couple bought in 2007, offered plenty of space on which to set their dream house and garden. The directive was simple: a three-bedroom, two-bath house with a pool that would take advantage of their view of the Pacific, about two miles away as the crow flies and four by car. They brought Steely inspirations that included Glenn Murcutt’s metal-roofed homes in Australia, and, says Mayer, “a huge file of images.” The architect answered with an open-plan layout roughly divided into public and private halves, partially bisected by an elongated pool and defined by a massive, horizontal concrete roof beam whose concrete supports allow the use of floor-to-ceiling glass on the ocean side. “The beam spans so far that fewer columns are necessary, providing huge expanses of uninterrupted space,” Steely says. 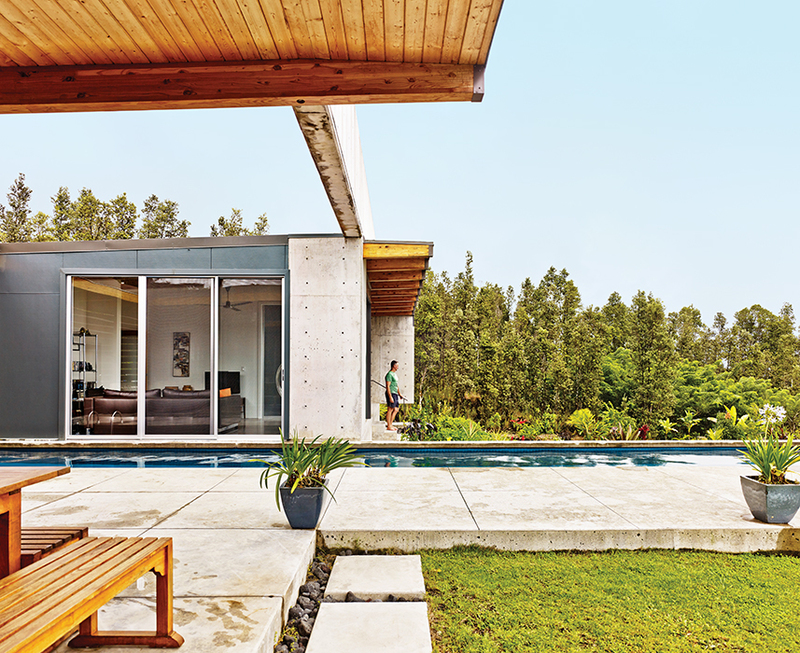 Because the couple didn’t want their home to read as a cold box, Steely incorporated a warm wood ceiling and added to the 2,800-square-foot footprint another 1,000 square feet of lanais, or porches. To help tame the wild site, Mayer, armed with undergraduate and graduate degrees in landscape architecture, laid out a mostly native garden and planted a small coffee grove—“just enough for us, friends, and family,” he says. He conceptualized meandering paths of pumice-like lava that give way to spongy lawns and low planting beds that, with the help of the wet weather, will soon grow to blend in with the surrounding ohia. 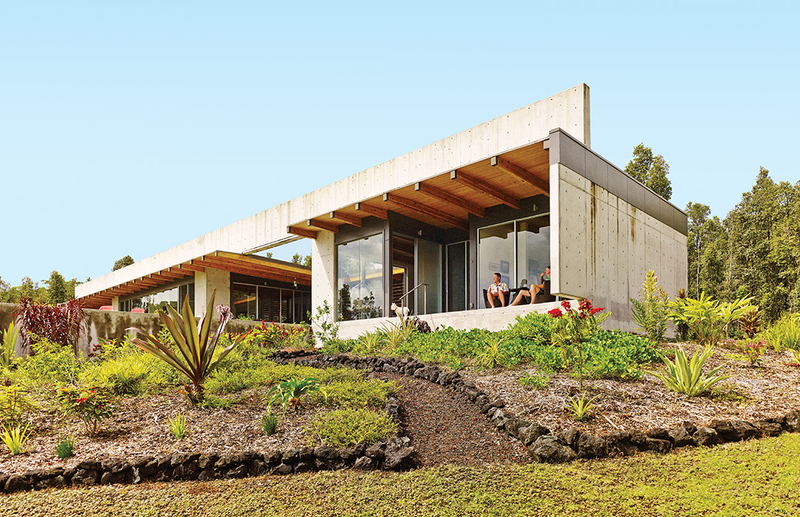 As in the other Lava Flow houses—which Steely describes as having in common “few materials, sparse construction, and linear planes that open up the homes to the surrounding lava, sky, and ocean”—little was left to waste. When the concrete mixers needed to pour the remnants out of the truck at the end of the job, “we didn’t want concrete all over the place, and we knew Craig and Rick would need to walk in front of the house,” says Steely. So the team devised a plan for the overflow: a series of pavers just beyond the lanai resembling a row of fat piano keys that add a smooth transition from the house to the adjacent lawn. Now settled into the house, the couple have grown accustomed to—even dependent upon—the intense rains. “Living on the windward side, we’ve become used to falling asleep to the sound of rain on the roof—it’s like white noise,” says Mayer. “When it doesn’t rain, I get a little jittery.” When the sky clears, the pair can be found poolside, beneath the great concrete bridge, sipping the fruits of Mayer’s first coffee harvest and watching the world go by.